President Trump arrives at a campaign rally in Elkhart, Ind., on May 10, where he tried to fire up support for GOP Senate candidate Mike Braun, who is challenging Democratic incumbent Sen. Joe Donnelly in a state Trump won easily in 2016. 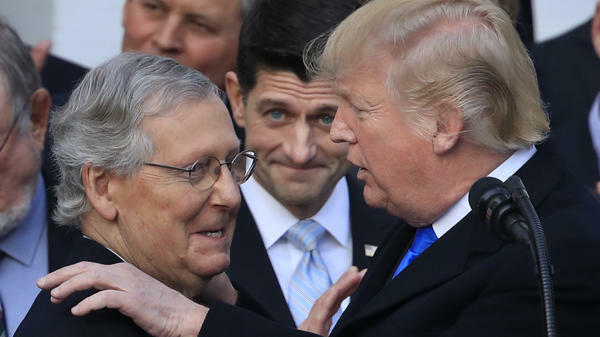 Senate Majority Leader Mitch McConnell, R-Ky., and House Speaker Paul Ryan, R-Wis., join President Trump at the White House to celebrate passage of the GOP tax cut bill in December. Republicans agree that if Trump focuses on promoting the tax cuts and strong economy, it will boost Republicans in the fall elections. 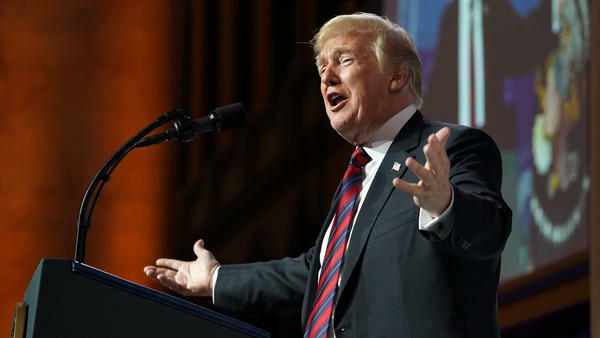 President Trump speaks at the Susan B. Anthony List 11th Annual Campaign for Life Gala at the National Building Museum in Washington on Tuesday. The White House is also sending out warnings to congressional Republicans that while they think the president is pulling his weight, folks on Capitol Hill need to take the political challenges they face this fall more seriously. "This is what a midterm president looks like"
Trump has famously discarded a lot of political traditions. But he is approaching the November elections in a remarkably traditional way. He raises money. He holds rallies to motivate his base. At a rally in Indiana recently he reminded his supporters that his entire agenda — "all of the great momentum we're having on jobs on safety and security on our military ... it's all at stake in November." He bashes his Democratic opponents: "Nancy Pelosi and her gang, they've got to be voted out of office!" In a recent interview, White House political director Bill Stepien was relaxed and upbeat. "I saw a reporter tweet after the Indiana rally, in which they said, 'This is what a midterm president looks like.' And they're right," Stepien said. "This is what a midterm president looks like." He was pointing to a rally the president held two weeks ago, in a state Trump won by nearly 20 percent and where Democrat Joe Donnelly is running to keep his Senate seat. Stepien predicted that Trump would stick to the playbook: raising money, holding rallies, making the contrast with Democrats and making the kind of argument that any president intent on winning a midterm election would — that he and his party have improved the economic and personal security of average Americans. "The president is committed to his party as the party leader, to doing all he can to help fellow Republicans this fall," Stepien said. "He's doing all he can to do the things he was elected to do." Every midterm election is a referendum on the party that controls Congress, and if that party also has the White House, then it's a referendum on the president too. Presidents Bill Clinton, George W. Bush and Barack Obama all lost control of one or both houses of Congress in a midterm. This will be a tough year for Trump and his party, but Stepien pointed to some recent good news for the GOP: Trump's approval rating is inching up, the big generic ballot advantage Democrats once had has shrunk and public opinion on the direction of the country is better than it has been in years. Close to 40 percent of Americans think the country is on the right track — not the kind of sentiment Stepien thinks signals a big anti-incumbent wave forming. What does Trump think the election is about? Corey Lewandowski had an answer. "It's a very simple question," said Lewandowski. "Are you and your family better off today than you were two years ago? And I think, by and large, you know, the answer is yes." Trump's former campaign manager is now an adviser to Vice President Pence's PAC, The Great America Committee, a strategic post. Unlike Lewandowski's previous home at the president's superPAC, the Great America Committee's fundraising is restricted, so now Lewandowski can coordinate with the White House and congressional campaigns. "The indicators say that if the midterm elections are about the direction of the country, Donald Trump wins," Lewandowski added. But that's just it — Congress is on the ballot, not Trump. Lewandowski framed the fall as a matter of victory for the president, indicating how Trump is taking this election personally, regardless. And sometimes at rallies, Trump makes it all about him. Recently in Michigan, he said this to a loud reaction from his supporters: "We have to keep the House. Because if you listen to [California Democratic Rep.] Maxine Waters, she goes around saying, 'We will impeach him! We will impeach him!' "
A Republican House is the best defense against impeachment, even though the issue itself is something Democratic leaders are working very hard not to run on. Trump brings it up on the campaign trail and he tweets incessantly about it: the Russia investigation, or as he calls it, "WITCH HUNT!" "Hoax!" And now there's a new, Trump-branded conspiracy theory: "SPYGATE." Although many Republicans consider anything other than the economy and the Republican tax cuts to be off message, there's some polling that suggests playing up the threat of impeachment could help the president energize his core supporters. Polls show voters souring on the Russia investigation. A few months ago, special counsel Robert Mueller had the support of a majority of Americans who thought his investigation should proceed unimpeded. It now appears the president's relentless effort to undermine Mueller's credibility is bearing fruit. A majority of Republicans and a growing number of independents say the investigation should wrap up. Impeachment is also unpopular outside the core Democratic base. As Republican pollster Kristen Soltis Andersen said, "There's a reason why Republicans are much more eager to talk about the specter of impeachment. And it's because those voters in the middle, even if they are not in love with everything the president says or tweets, they don't want to see him obstructed. They don't want to see him thrown out of office." They might be inching up, but Trump still has historically low approval ratings. The number of Americans who strongly disapprove of him is much bigger than the number of voters who strongly approve of him — a sign of Democratic intensity. But the president has a few things going for him this year. He's able to raise tremendous amounts of money, and he has the most favorable Senate landscape Republicans have had since direct elections of senators began in 1914 — in other words, ever. The Senate battleground map is Trump country. There are 10 Democratic Senate incumbents running for re-election in states Trump won in 2016, and five of those states are deep red states he won by 20 points or more: Indiana, West Virginia, North Dakota, Missouri and Montana. So far, Trump hasn't held a campaign rally in a state he didn't win. And to help Republicans increase their majority in the Senate he won't have to. He has been to Missouri, Indiana and West Virginia recently, happily bashing Democratic Sens. Claire McCaskill, Joe Donnelly and Joe Manchin, respectively, for voting against his agenda. The House battleground is more problematic for the president. The Republicans are defending districts that Hillary Clinton won in 2016, in states like California, New Jersey and Pennsylvania. It remains to be seen whether Trump will dare travel outside his red state comfort zone this fall. Republicans want him to talk about tax cuts and the economy. Corry Bliss, who heads the Congressional Leadership Fund, the superPAC aligned with House Republican leaders, said it's fine for Trump to energize the base with talk of impeachment or illegal immigration. But Bliss added, "The most important issue is always going to be jobs and the economy. So anything he can do to sell that is helpful." But sometimes the president doesn't want to talk about tax cuts. In fact, at a recent event in West Virginia, he literally threw his talking points up in the air. "I'm reading off the first paragraph, I said this is boring, come on," Trump told the crowd, and he got a laugh. He also got a laugh this week speaking at a fundraiser for abortion-rights opponents, but GOP leaders might not have found it so funny when Trump joked, "So, your vote in 2018 is every bit important as your vote in 2016, although I'm not sure I really believe that, but you know. I don't know who the hell wrote that line!" Even though it was in jest, it reminded Republicans of their nightmare scenario — that Trump undercuts the core message about how important it is to turn out in November, even though Trump is not on the ballot. "Donald Trump makes things more complicated for Republicans because they want to focus on the economy, they want to focus on the extent to which people have seen personal benefits from tax reform," said Soltis Anderson. "The latest tweet that drives the news cycle inevitably takes the conversation away from that, and so it's tough for some of these candidates to cut through the noise." But if Republican candidates want the president to focus on the economy, the president's advisers want Republican candidates to focus on their races. There is a sense among some White House aides that Republican House candidates don't really understand what they're facing this year. Political director Stepien says the president plans to work his heart out raising money and campaigning for his party, and he wants to make sure Republican members of Congress understand they should be running as if their political lives depended on it. "The president does, and he hopes others in his party do," said Stepien. "You really don't understand how hard a midterm election is until you've been through one before, and a good many Republicans were elected in 2010 and 2014 when the opposite challenges were facing the party — when, in fact, there weren't challenges at all." In fact, 77 percent of Republicans in the House today were elected in years when Obama was in the White House and the wind was at their backs. This year, Republicans are facing headwinds. The question is how much President Trump will be able to do to shield them. The Republican Party heading into this fall has a president who loves to campaign. President Trump is holding a lot of big rallies, and he does have a larger playbook to follow that his advisers think can keep the GOP in power. Here's NPR's Mara Liasson. MARA LIASSON, BYLINE: Every midterm is a referendum on the party that controls Congress. And if that party also has the White House, it's a referendum on the president too, says Kristen Soltis Anderson, a Republican pollster. KRISTEN SOLTIS ANDERSON: For Democrats, Donald Trump's name functionally is on the ballot. Those voters are fired up and motivated to turn out against the president. But it remains to be seen if Republicans match that enthusiasm on their side with Donald Trump not up for election this year. LIASSON: This is the same problem that previous presidents have faced. Presidents Clinton, Bush and Obama all lost control of one or both houses of Congress in midterm elections. I asked Corey Lewandowski, Trump's former campaign manager, who still advises the president, what Trump thinks this midterm is all about. COREY LEWANDOWSKI: It's a very simple question - are you and your family better off today than you were two years ago? The indicators say that if the midterm elections are about the direction of the country, Donald Trump wins. LIASSON: Donald Trump wins. Actually, Donald Trump is not on the ballot, but as Lewandowski suggests, the president takes this midterm personally. And although Trump has famously discarded a lot of political traditions, he's approaching the November election in a remarkably conventional way. Just like his predecessors, when Trump is on the campaign trail, he tries to motivate his base. PRESIDENT DONALD TRUMP: And all of the great momentum that we're having as a country on jobs, on safety, on security, on our military, it's all at stake in November. LIASSON: He attacks his Democratic opponents. TRUMP: ...They've got to be voted out of office. They've got to be voted out of office. LIASSON: But sometimes, he makes it all about him. TRUMP: ...She goes around saying, we will impeach him, we will impeach him. LIASSON: The threat of impeachment, which Democrats are working hard not to run on, could actually be helping the president energize his core supporters. As the president's poll numbers rise and the big generic ballot advantage the Democrats once had shrinks, polls also show voters souring on the Russia investigation, says Kristen Anderson. ANDERSON: It's not just for Republicans. Even independents are now saying this investigation seems like it's gone on for a while. Let's wrap this up. Similarly, I think there's a reason why Republicans are much more eager to talk about the specter of impeachment. And it's because those voters in the middle, even if they are not in love with everything the president says or tweets, they don't want to see him thrown out of office. LIASSON: But mostly voters don't care about the Russia investigation, and that's why Republicans say they'd prefer the president stick to the talking points about the economy and the Republican tax cuts. Corry Bliss runs the Congressional Leadership Fund, the Republican House leadership super PAC. CORRY BLISS: Ensuring that the base turns out and motivating the base is very important. But the most important issue is always going to be jobs and the economy. So anything he can do to sell that is helpful to anything we can do. LIASSON: But sometimes the president doesn't want to talk about tax cuts. At a tax reform event in West Virginia recently, he literally threw his prepared remarks on taxes up in the air. TRUMP: Now, I'm reading off the first paragraph. I said this is boring. Come on. LIASSON: And sometimes, like at a fundraiser on Tuesday night, he goes way off message, even when he's joking. TRUMP: So your vote in 2018 is every bit as important as your vote in 2016, although I'm not sure I really believe that, but you know. ANDERSON: Donald Trump makes things more complicated for Republicans because they want to focus on the extent to which people have seen personal benefits from tax reform. So it's tough for some of these candidates to find a way to cut through the noise. LIASSON: If Republican candidates want the president to focus on the economy, the president's advisers want Republican candidates to focus on their races. White House political director Bill Stepien says the president plans to work his heart out raising money and campaigning for his party, just like a typical president in a midterm election. And the president wants to make sure Republican members of Congress understand they should be running as if their political lives depend on it. BILL STEPIEN: The president does, and he hopes others in his party do - you really don't understand how hard a midterm election is until you've been through it before. And a good many Republicans were elected in 2010 and 2014 when the opposite challenges were facing the party when in fact there weren't challenges at all. 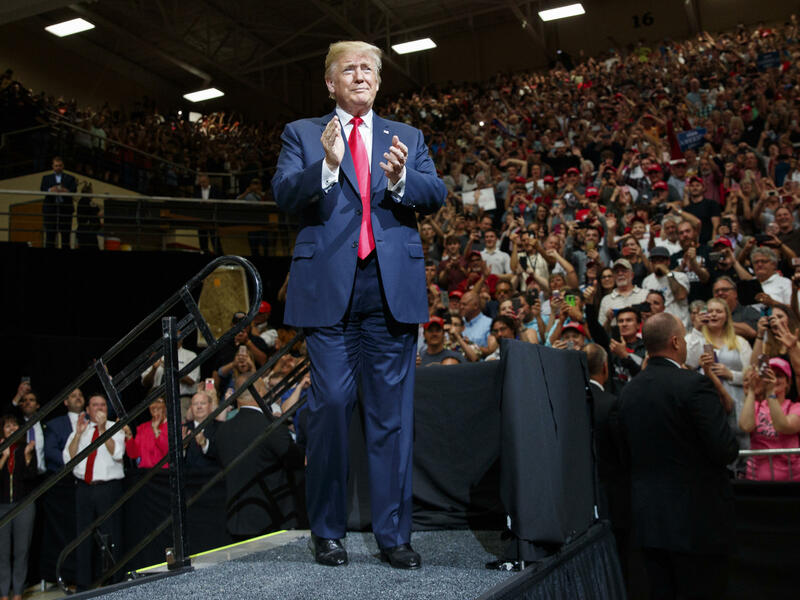 LIASSON: This year, Republicans have plenty of challenges, although it's not clear yet how big a blue wave Republicans will face in November or how much President Trump will be able to do to shield them from the impact. Mara Liasson, NPR News, Washington. Transcript provided by NPR, Copyright NPR.